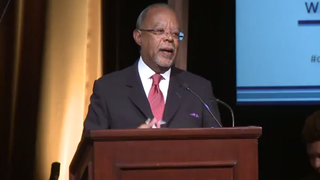 The Root’s editor-in-chief, Henry Louis Gates Jr., was one of 14 recipients Tuesday night of an Alfred I. duPont-Columbia University Award, with Gates honored for his PBS series The African Americans: Many Rivers to Cross. The six-part documentary explores the evolution of the African-American people, as well as the multiplicity of cultural institutions, political strategies, and religious and social perspectives they developed—forging their own history, culture and society against unimaginable odds. The African Americans: Many Rivers to Cross has also won an Emmy Award for Outstanding Historical Programming—Long Form, the Peabody Award and an NAACP Image Award and is currently available on DVD.